UMP | University of Minnesota Press Blog: Remembering Paul and Sheila Wellstone: "Together, they touched countless lives." Remembering Paul and Sheila Wellstone: "Together, they touched countless lives." to make our country better." The following is a piece by Walter F. Mondale about the late Sen. Paul Wellstone and his wife, Sheila, who died in a plane crash eight years ago today. This piece appears as a Foreword to Twelve Years and Thirteen Days: Remembering Paul and Sheila Wellstone (2003). Paul Wellstone was one of the most valiant public servants I have ever known, and he and his wife Sheila were among the most impressive public couples in America. Paul considered Sheila to be his cosenator and they fought to change this country and affirm the democratic ideals that we cherish. Together, they touched countless lives. Paul came seemingly out of nowhere to defeat a well-funded incumbent senator in 1990, but his victory was not a fluke: he built a winning campaign by encouraging thousands of Minnesotans to organize and become involved in the political process to demand a government that truly served them. Minnesotans voted for Paul because they knew his concern for them was genuine and he truly would represent "the little guy" in Washington. During his twelve years as a U.S. senator, Paul championed the causes of working men and women, family farmers, seniors, children living in poverty, and veterans. He worked to maintain and strengthen environmental protections. He resisted efforts to privatize Social Security. He fought for affordable prescription drugs for seniors and decent health care for everyone. He collaborated with Republican members of the Senate to pass legislation mandating that mental health care be covered by Medicare and insurance providers. Sheila was a tireless advocate for victims of domestic violence and, with Paul, coauthored the first Violence Against Women Act in 1994. A few weeks before Election Day in 2002, when Paul was again locked in a tough reelection campaign, I asked him, "Paul, are you going to win this election? What do the polls say?" And he said, "Never mind the polls. I've got a secret weapon that they don't know about. I've got the best kids that any candidate ever had in a campaign, and on Election Day they will show us how to win." Paul had proven twice before that grassroots politics is a winning politics, and I think all Minnesotans knew that Paul was going to win that election. When his plane went down on the morning of October 25, it was as if the world had been suddenly turned upside down. While we grieved over such an enormous loss, we knew that Paul would want us to carry on the fight. I was deeply honored when David and Mark Wellstone asked me to take their father's place on the ballot even though to begin a political campaign at one of the saddest moments in Minnesota history felt almost unseemly. Yet someone had to carry Paul's torch and make certain that this tragedy did not end in futility. We kept the faith and fought the good fight. I am very proud of the campaign that we ran and proud of all of the volunteers and staff who regrouped and gave all that they had. I know Paul would have been proud, too. On the morning after the election, I told the many young people who worked so hard on the campaign that one's ideals are often tested more in defeat than in victory. This was not the end but the beginning of what they could do for our state. More than anything, Paul would want us all to stand up and keep fighting. Terry Gydesen spent many hours on the campaign trail in Paul's now-famous green bus. She photographed Paul greeting people on the street and in cafes, speaking at political rallies at union halls and colleges, encouraging his campaign volunteers, and celebrating his remarkable victories with his family, friends, and supporters. Terry captured the infectious enthusiasm, spontaneous joy, and boundless energy that Paul brought to doing what he loved best: meeting people, laughing and crying with them, listening to their concerns, and striving to earn their trust as their public servant. When Terry learned of the plane accident she immediately went to the Wellstone campaign office in St. Paul. She photographed the stunned reaction of campaign staff, volunteers, and supporters who gathered there. She poignantly captured the grief and outpouring of affection for Paul and Sheila, which was especially evident in the impromptu shrine that grew along University Avenue day by day outside the office. Terry traveled with Joan and me just as she had with Paul and Sheila, documenting our remarkable and brief campaign as we endeavored to succeed our martyred senator. When it became apparent that we had not won, Terry was also there to capture our disappointment. Paul and Sheila Wellstone will live long in the memory of Minnesotans and people throughout the world who share their commitment to democracy. May this simple and elegant book of photographs help keep their memory alive and inspire us to be the active trustees of their legacy of social justice and decency. 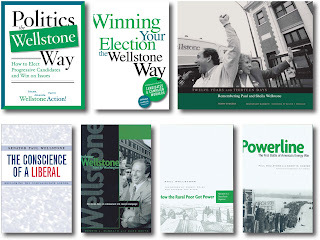 Read more about Paul Wellstone and the legacy he has left.